Particle & Surface Sciences presents the Micromeritics ChemiSorb HTP high throughput chemisorption analysers. Optimum design and efficient utilisation of catalysts require a thorough understanding of the surface structure and surface chemistry of the catalytic material. Chemical adsorption analyses can provide much of the information needed to evaluate catalyst materials in the design and production phases, as well as after a period of use. Micromeritics ChemiSorb HTP is a fully automated range of high throughput chemisorption analysers that determines the per cent metal dispersion, active metal surface area, size of active particles and surface acidity of catalyst materials. Featuring six independently operated analysis stations, Micromeritics ChemiSorb HTP allows multiple analyses to be run simultaneously on one instrument, not only saving time for busy catalyst operations but also economising valuable lab space. The ChemiSorb HTP features a vacuum system and manifold with constantly monitored pressure transducers on each of its six analysis stations. Each port is also equipped with a furnace enabling independent control of sample temperature and ramping from 10ºC above ambient to 700ºC. The temperature is recorded with each equilibrium pressure to provide high quality isotherms. An equilibration option allows the user to specify different equilibration times. 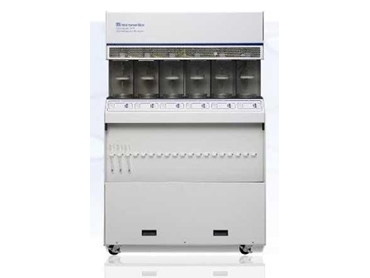 A mass flow controller is installed in each station to ensure accurate and reproducible flow through the sample. Up to 12 different gases can be attached to the ChemiSorb HTP simultaneously. Samples are degasssed in-situ prior to analysis. Each analysis station can operate concurrently and independently of one another. Samples may be added or removed from degas/analysis stations without disturbing the treatment of other samples. The instrument features long unattended analysis times and a high-throughput mode that allows the user to start multiple parallel analyses. The Windows-based ChemiSorb HTP analysis program simplifies the operation of the analyser and allows the user to run other applications while an automatic operation is in progress.